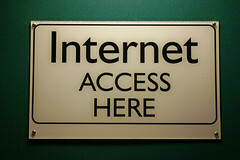 I choked today on an article in The New York Times, saying that Internet Access is not a human right. It almost sounds like citizen journalism is the target here. And it completely forgets where free speech is practiced in the future. and your new pen and paper together. It's essential to have the right to express yourself. Not only this, you have the right to actually do it. In the age of information now, with the evolution of electronic media, not only our focus has changed, but the importance of certain ways to express opinion and giving out information. In the future, the electronic networks will be the only important way to effectively spreading information and people opinions. Therefore the right to freely speak alone isn't effective anymore. The Internet access isn't something we can do with our minds. We need an interface, a connection. And this connections has to be treated the same way. While the evolution of electronic communications are growing faster every day, and the usage and number of people relying on the network, governments all over the world trying to regulate and restrict certain parts of the Internet to their needs. Our possibility for free speech is going be taking away. And that shall not happen. It's clear, that very quickly, the UN must proclaim Internet access as a human right. The article to me shows fear. Fear that citizen journalism is the only actual journalism in the future. Fear that the live videos from the New York protesters, are more relevant to people than a redacted article, smoothly written together with officials. That fear is possibly also a topic at the NYPD, as they use special lights to malfunction digital cameras. Why? Fear to let the world know the truth? No matter if you're a protester on Tahrir square, or a protester at the Occupy Wall Street movement, if authorities can legally cut you off from the net, it's like they cut your virtual tongue out. And your virtual tongue needs to be protected by human rights the same way than your real one, because in the future, there is no difference anymore.